Tender wedges of fiery winter squash make a delicious side for a holiday dinner. 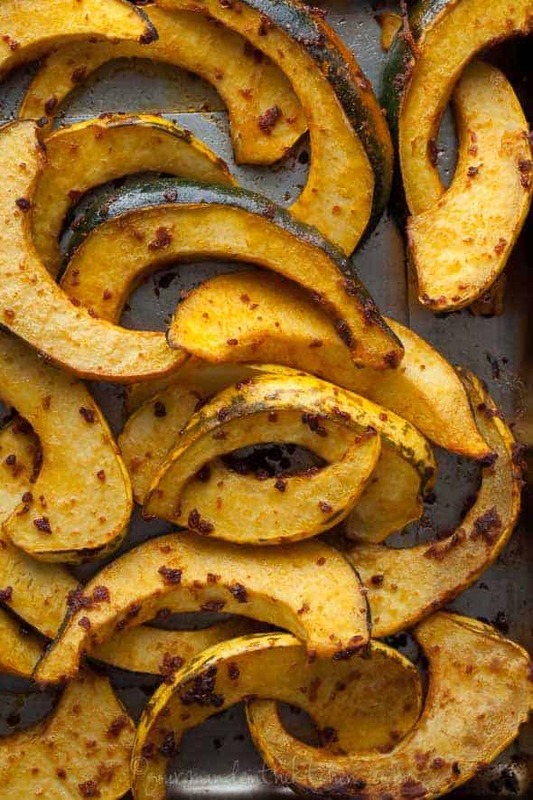 If you’re looking for a versatile fall vegetable, squash certainly does the trick. From soups and starters, to salads, sides and even desserts, you’ll find this seasonal favorite in all kinds of dishes. What I have for you today is a simple side filled with fire and spice and hint of sweetness. It’s a vibrant medley of winter squash roasted quickly in a hot oven to bring out its natural sugars and punctuated with the heat of spicy harissa. The process starts by giving your best chef’s knife a good workout. 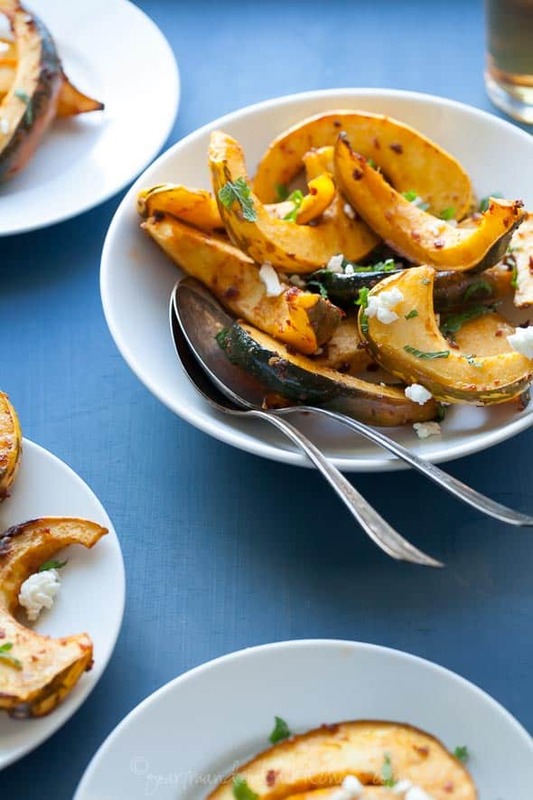 The squash is cut into wedges then tossed with a blend of olive oil, harissa and spices. 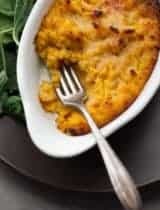 The sweetness of the squash is balanced by the fiery heat of chili peppers and earthy depth of both cumin and coriander. Into the oven they go to roast and caramelize, where they get wonderfully tender. There they end up lightly browned around the edges, the flesh tender and easily separating from the skin. 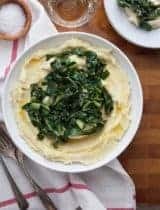 Once out, creamy feta is crumbled on top for a salty bite and a sprinkle of chopped mint adds a pop of freshness. You can make this side with and blend of squash you’d like but I choose acorn and carnival squash for their smooth fine textured flesh. 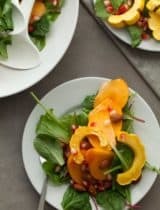 Toss leftover squash pieces with some greens and a quick vinaigrette the next day for an easy lunch. Perfect for the holiday table, or any night of the week I’d say. 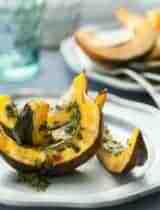 Toss squash with olive oil, harissa, cumin, coriander, maple syrup and salt. 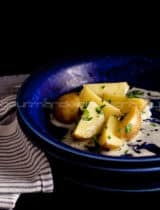 Arrange the wedges cut sides down on a baking sheet. Roast squash, tosing squash and switching position of pan halfway through roasting, until squash is tender (about 25-30 minutes). 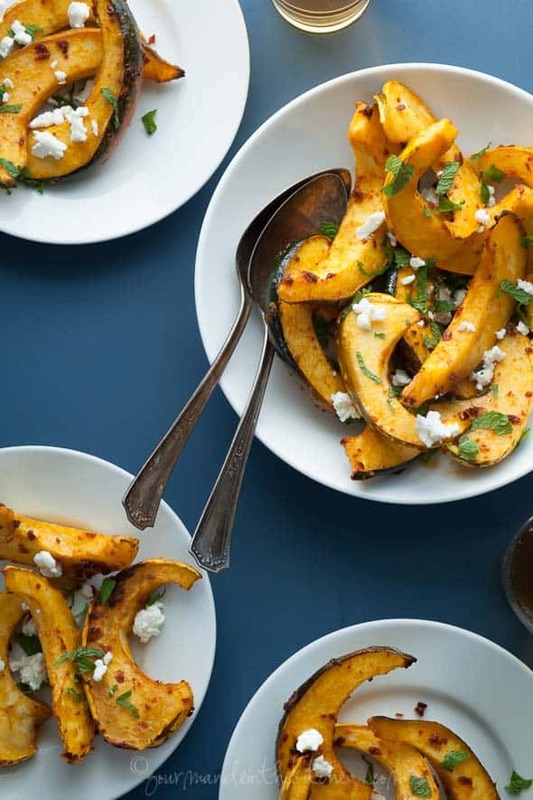 Transfer squash to a platter and top with crumbled feta and chopped mint. Serve warm. WOW! I love squash in any form. I love how this is both sweet and spicy--complete perfection. The harissa with the maple sounds amazing!!!! 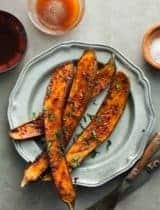 I love harissa..and squash so this sounds like such a fabulous side dish! Yes, my squash definitely gets a good workout whenever I cook squash. This roasted squash would definitely be a big hit around here! Wow this looks delicious! Love all of those flavors. Great spice blend on this dish! Squash and pumpkins ... I can eat in any form. Lovely blend of flavor kick! So pretty and so delicious!! 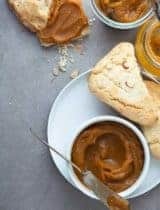 I'm intrigued by the combination of sweet and spicy in this recipe! I've always gone the sweet route with my squash recipes! Oh gosh - this looks amazing! I love when food is beautiful. This alone could be dinner. This squash looks so delicious! I would happily eat a whole tray of this for dinner. this looks amazing. I haven't had the change to use Harissa paste much, can't wait to try this! 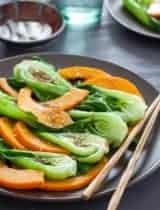 My favorite vegetables are always roasted so I am adding this recipe to my repertoire. Also your photography is amazing! Any advice would be most appreciated! GORGEOUS! I love the fiery flavors and the feta and mint finish. A must try! Your post gave me the idea of a three course meal with squash being in very dish! too much!? Definitely my favorite food right now and the way you have prepared it looks amazing.